The electronic pressure switch model PSD-4 pressure switch represents the extensive further development of the PSD-30 electronic pressure switch, itself already awarded with the “iF product design award” for its outstanding functionality. A high accuracy of 0.5 %, freely configurable output signals (PNP/NPN, 4 ... 20 mA/0 ... 10 V), the 5:1 scalability of the analogue output, in addition to outstanding self-diagnostics, make the PSD-4 an excellent automation solution. 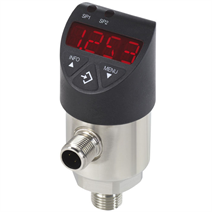 With the optional output signal in accordance with the IO-Link communication standard, the PSD-4 electronic pressure switch allows a fast integration into modern automation systems. IO-Link offers simpler and faster installation, parameterisation and higher functionality for the PSD-4.